For the pet owner who likes to travel and enjoys the outdoors, a soft-sided carrier like the Cosmic Pet Carrier is an almost essential piece of equipment. Mr Miyagee enjoys playtime and traveling in his carrier. Collapsible crates like the Cosmic Pet Carrier are the best dog crates way to save space and provide a comfortable and cozy enclosure for your canines or felines and even if you just need a carrying case for your small dog you’ll be thrilled with the light weight and slim profile of this wonderful product. The Cosmic Pet carrier is by far the best pet carrier for travel and training and also provides a safe space for pets in times of illness or during travel in the car. Mr Miyagee deserves the best, and these highly portable dog crates are the way to go if you’re on the move a lot like us. Save space and provide a great environment for your dogs, with affordable pricing and stylish features there’s no reason for any dog or kitty owner on the move to not make the investment in one of these great soft dog crates from Cosmic Pets. Making the most of playtime…nap time..and travel time. The Cosmic Pets team are friendly and very helpful. Service excellent with amazing products to chose from. 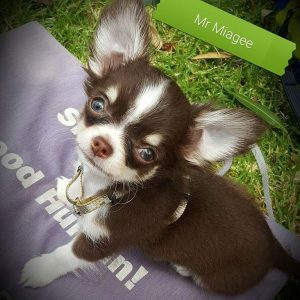 Def a paws up from the Pet Mall SA Dare 2 Care Ambassador Mr Miyagee and his human sidekick!